Welcome back. 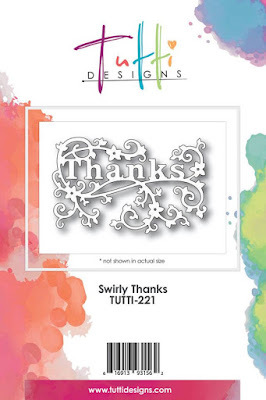 Hi, Nancy Hill and excited to share with you one of my favorite dies called Tutti Designs Swirly Thanks in the October 2016 release. You will want all six of the Tutti Designs Swirly word dies in their October Folder. I cut the Tutti Designs Swirly Thanks using gold glitter card stock. I used a Sue Wilson embossing folder, leaves and die on the background of this card. I adhered a crochet butterfly on the corner. I made a double satin bow and adhered a Wild Orchid rose in the center. This will be my last posting for Tutti Designs. I am cutting back this summer with my crafting since my son will be getting married in August. Due to this year's unusual weather with records of snow and rain, the farming and ranching work will come all at once when it stops raining and the weather will get warmer. I want to thank all of the wonder Tutti Designs Team Members, Bailey of Tutti Designs and especially Darlene who has supported this team and has been a wonderful supervisor/coordinator. 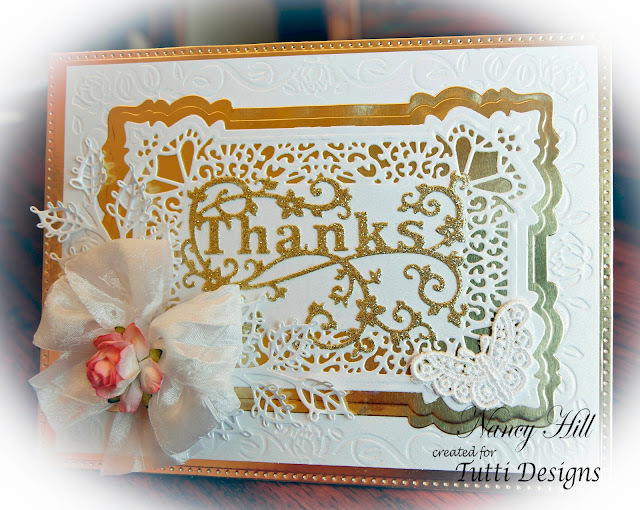 Especially want to thank Tutti Designs Company for allowing me to be on this team and work with their gorgeous dies. This card is GORGEOUS (I should know since you sent it to me! lol ... amazing design). We will miss you Nancy and wish you all the best in your farming & crafting adventures! Don't be a stranger ... Hugs and thanks for all your hard work! Gorgeous card. I would never have thought to layer the Thanks on the SW Seville like you did. I will definitely be using your idea in the future. Good luck and thanks for the share.